Most of us didn't grow up with a lot of fancy toys and gadgets, but always found that there were not enough hours in the day to play. Our minds were constantly churning out new games and building new toys right out of the resources we had. And no, this isn't a 'those good ol' days' post'! Playing is very crucial to a child's development and so are toys. But a good toy, in my opinion, is one that leaves wide space for the child to imagine, explore and create. So, I absolutely like the trend of returning to all natural toys and unstructured play. Wooden toys, for example, are making a comeback. Not only do they look great, but there is a focus on the simple and hassle-free, not to mention environment-friendly. 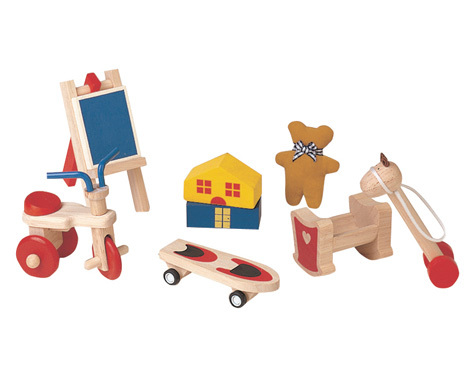 A company called Plan Toys makes them, and so does IKEA, among others. Unstructured play is a term being tossed around too,where kids are given a few simple tools and resources and left to explore 'play' on their own. A favourite blog of mine is Play at Home Mom LLC, which has dozens of ideas on this. I'd like to get back to papercraft and other art projects as a way of not only playing but bonding with our kids. Loads of ideas on Pinterest on this. What really irks me is those noisy, electronic siren toys that just wail on for what seems like hours on end! Except the ones that are informational, like teaching the alphabet or spelling. And what's the deal with toy guns? What message are we sending there? They should be banned! Really, handing a gadget with unlimited internet access is really easy but also puts a cap on a child's cognitive development, no matter what their age. Gadgets do have their benefits, including television, but supervised usage is the key here. Let's focus on getting those little hands and feet dirty instead!